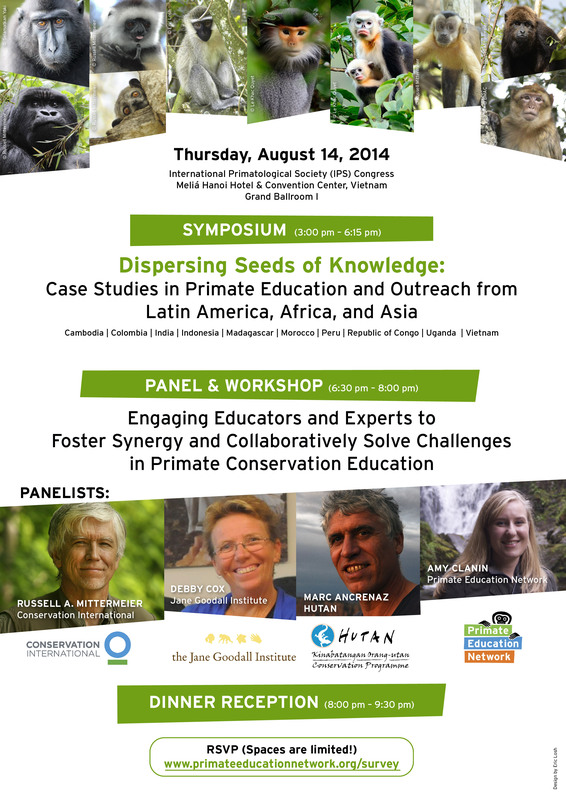 Join PEN and our colleagues at the International Primatological Society (IPS) Congress! PEN will begin this symposium (see timetable) by providing an overview of the global landscape of primate education and the network’s measurable progress since its introduction at the 2012 IPS Congress. 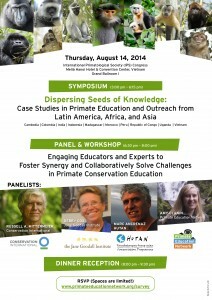 Case studies for this symposium will be represented from Colombia (PEN), Peru (Yunkawasi), Morocco (Barbary Macaque Awareness & Conservation), Republic of Congo (Jane Goodall Institute), Uganda (UNITE for the Environment), Madagascar (Conservation Fusion), India (Primate Research Centre NE India), Cambodia (Angkor Centre for Conservation of Biodiversity), Vietnam (Denver Zoo), and Indonesia (Selamatkan Yaki). To build on insights shared at the symposium, PEN is hosting a panel to discuss the future direction of primate education and our network. Following the panel, participants will share region-specific challenges in their conservation education programs as brief case studies. Each panelist and PEN's Regional Coordinators will provide expertise and promote collaboration among participants working across borders, cultures, and species to develop actionable solutions for their respective reality-based problems. After participants present their new and collaborative solutions to the audience, food and drinks will follow at a PEN reception. 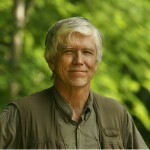 Russell A. Mittermeier has served as President of Conservation International since 1989. Named a “Hero for the Planet” by TIME Magazine, Russell, a trained primatologist and herpetologist, is regarded as a world leader in the field of biodiversity and tropical forest conservation. He has conducted fieldwork in over 20 countries, with a primary focus in Brazil, Suriname, and Madagascar. 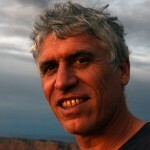 Russell’s many roles include Chairman of the IUCN Species Survival Commission Primate Specialist Group, a member of the Steering Committee of the Species Survival Commission, Adjunct Professor at the State University of New York at Stony Brook, Research Associate at the Museum of Comparative Zoology at Harvard University, and President of the Margot Marsh Biodiversity Foundation. He discovered and described three lemurs and six Amazonian monkeys. Two lemur species were named in his honor. Russell was elected an Honorary Lifetime IUCN Member in 2012. 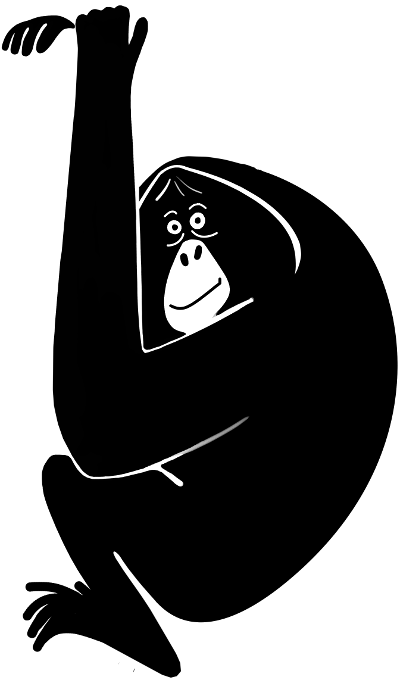 In addition to publishing 29 books and more than 650 scientific and popular articles, he launched Tropical Field and Pocket Guide Series focused heavily on primates. Russell has received numerous honors such as the San Diego Zoological Society’s Gold Medal, Order of the Golden Ark of The Netherlands, Brazilian Muriqui Prize, Order of the Southern Cross of Brazil, Aldo Leopold Award from the American Society of Mammalogists, Association of Tropical Biology’s Special Recognition Award for Conservation, Harvard University’s Roger Tory Peterson Medal, and too many others to mention. Debby Cox started her career in chimpanzee captive management at Australia’s Taronga Zoo in 1986. As a Primate Unit Leader, she traveled to zoos worldwide to review management and facilities of great apes. In 1993, Debby volunteered in Burundi at the Jane Goodall Institute’s (JGI) halfway house for confiscated chimpanzees. She returned the next year as the Co-Director, and then went on to establish a sanctuary in Uganda. For the next three years, she trained keepers and assisted in the redesign of facilities at the Uganda Wildlife Education Centre. From 1998 to 2004, Debby acted as both Project Director of the Ngamba Island Sanctuary and Director of JGI Uganda, while completing a master’s degree in Environmental Sciences at the Australian National University. A founding member of the Pan African Sanctuary Alliance, Debby continues to serve on its Steering Council. 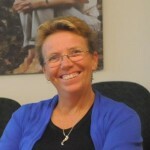 She has assisted with the development of various IUCN Best Practices guidelines, including: Human Great Ape Conflict, Great Ape Tourism, and Survey Techniques for Great Apes. In 2008, Debby was elected to the position of Vice President for Captive Care of the International Primatological Society. Since 2009, when she handed over the directorship of JGI Uganda, she has served as a roving consultant, providing technical support within the Africa Program countries for JGI. Marc Ancrenaz, M.Sc., DVM, is the Scientific Director of the French NGO HUTAN and Co-Director of the Kinabatangan Orang-Utan Conservation Programme, a community-based initiative that has been active in wildlife research, conservation, and community development in Sabah, Malaysian Borneo since 1996. He is also a Scientific Advisor for the Sabah Wildlife Department. Additionally, Marc is the Co-Leader of the Borneo Futures Initiative that provides high impact, cutting-edge science combined with an efficient dissemination of results to increase awareness, collaboration, and understanding among decision makers, media, NGOs, and the general public in Borneo. Before moving to Sabah in 1998, he worked for four years as the Head of the Mammal and Veterinary Departments at the National Wildlife Research Center for the National Commission for Wildlife Conservation and Development in Saudi Arabia. Marc has an extensive background in wildlife research, medicine, and population management, as well as in wildlife management policy formulation with 20 years of working experience in wildlife range countries (e.g. Gabon, Congo, Saudi Arabia, Indonesia, and Malaysia). He is a member of the Executive Committee for IUCN/SSC Section of Great Apes, the IUCN/SSC Veterinary Specialist Group, the IUCN/SSC Conservation Specialist Group, and a reviewer for a number of international scientific journals. panel, workshop, and dinner reception. Join us at the IPS Congress! Take PEN's survey and RSVP to our symposium, panel, and workshop. ‹ Introducing PEN 2.0! New Tools. New Resources. New Website.